We drove to the amazing Museum of Art at Tigre 35 kilometres north on the outskirts of the Buenos Aires this morning,. The sun shone down hard on us all – it was soon reported to be 34°C. After morning vehicle safety checks from the team of Scrutineers, the crews enjoyed a lunchtime reception on the terrace and then took to a riverboat cruise down the River Plate back to our hotel. As we are in Fangio-country it’s no surprise that on the entry list we have the biggest ever team of Chevrolet Fangio Coupes that any rally has ever received, the Chevies lined up together and looked resplendent in the bright sunlight. 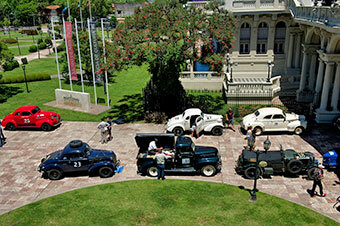 We have 12 different countries represented on the entry list, bringing 35 cars to our first South American event. Two cars reported troubles today – the Jaguar XK120, car 31, Michael Maedel and Roy Haddad, which last night had steering issues as the original steering had been replaced by a rack and pinion set up that had loose mountings. This morning the car had further troubles when the clutch failed – it has a non-standard BMW gearbox so it was off to a vintage car specialist to get a new clutch. The car looks low having been built for track events, and so appears vulnerable for dirt roads and clearly needs a lot more work if it’s to fully complete our route. If the car had been left in standard trim, it would be better suited to this course, according to our sweep-mechanics who have over 100 past events behind them. The second car in difficulties was car 28, the Buick of Udo Bichler from South Africa, and Tony Edwards, which had the radiator suddenly come loose, which hit the fan. The fan broke up, and the radiator is so badly dameged it needs to be replaced. A worry, but less work here than for the Jaguar crew. John Raker’s 1929 Ford Model A, veteran of the 2010 Peking to Paris, suffered a fuel blockage but was swiftly sorted by Rob Kitchen and Tony Jones, in the shadow of the 1912 art-deco museum. Our return to the Emperador Hotel was by boat down the River Plate. On the way, we sped through the delta-lands past colonial mansions, riverside clubs and all manner of watersports enthusiasts. Rusting hulks, gently decaying into the muddy waters of the world’s widest river mouth, were a highlight of our cruise. 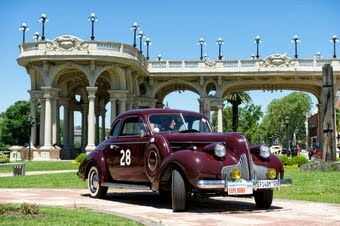 We are leaving tomorrow to rejoin our cars which were locked securely overnight at the Tigre Museum, and begin the first day of our 6,000 kilometre route and our first overnight stop of Rosario. Our day ended with hot news from London that Philip Young was a winner at the Octane Magazine’s Historic Motorsport Awards Night at the Renaissance Hotel in London. As Philip is with us here in Argentina, journalist Tony Dron took to the stage to collect his trophy - The Personal Achievement Award “for having invented Historic Rallying”. Jane Strange, Nikky Bannister, and others who help make the Rally Office a success filled the E.R.A. table at the glittering black-tie and ball-gown night of celebrations . Philip says the trophy is as much to do with their personal dedication as any single individual. The saying “behind every successful man is an even more successful woman” might be true but in this case but there are several women whose endeavours have made the past year so remarkably enjoyable for so many. The Octane awards night is the Sport’s premier annual awards ceremony and is attended by legendary figures such as Sir Stirling Moss, and compered by Le Mans winner Derek Bell, with over 200 of those who lead, invigorate, govern or participate in the world of Historic Motor Sport. Tony Dron was among those who took part in the early struggles to establish road rallying for classic cars, joining the likes of Paddy Hopkirk (who won the 1990 Pirelli Classic Marathon), Roger Clark, Moss, Makinen, Sprinzel and others from the “golden era” who all helped to set down a bench-mark and establish a new scene, which today goes from strength to strength. There are now more rallies than there are circuit-races with considerably more entrants and cars.